Call it one of the more degrading things for the average digital audiophile. Or, perhaps, call it something many proponents of analog have long championed. Call it art. Call it creative. Call it many things. Just don't call it music. In rummaging around the internet recently, I found an article detailing how one creative person transformed their CD collection, apparently gathering dust and no longer in use, into something more visually appealing. 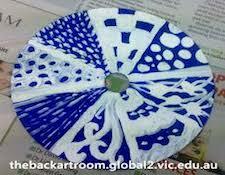 Basically, the CD was painted black then decorated. Once a sufficient number of CD's were completed, one might then have a decorative piece for a wall or someplace in the home. What a blow to the recording format once hailed as "perfect sound forever." Personally, and whatever the prevailing thoughts on CD's might be, and as an audiophile, I see this as a part tragic, part surprising turn of events. One reason why is I still listen to and purchase CD's and still happen to believe in the format - just like I believe in analog. I have a considerable amount of music on CD, most of which is not available as an LP, to which I regularly listen and enjoy. I cannot envision myself painting them to make cheesy wall art. Of course, then again, beauty is in the eye of the beholder. When the rise of CD's in the 1980's begat the fall of LP's, almost everyone hastened the album's demise. Everyone except, not surprisingly, that small enclave of loyalists called audiophiles. Analog proponents never gave up on the format they loved and despite the rest of the music listening world passing LP's by, the high-end community did not. Now, some thirty or so years later, the LP revolution is in full force and happily enjoying a popularity likely not experienced since the 1950's through the 1970's. I suppose it is fair to say the "ole girl still has some kick left." I wonder if CD's might one day enjoy a similar renaissance? I'd be running with blinders if I didn't recognize the popularity of first streaming, and secondly downloads, as a predominate force in musical formats today. 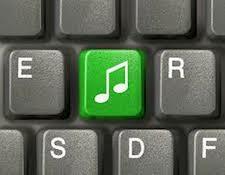 It does not take a supreme amount of investigative effort to understand this seismic shift in recorded music. Does this fact further enable the ultimate demise of the physical CD and promote using them for decorative wall art? In looking at physical music stores, presuming they might even be easily found, the CD section in most has grown considerably smaller. One such store near me used to be 90% CD's, 10% movies and 0% LP's. Now they are about 45% LP's (both new and used), 45% CD's (both new and used) and 10% movies. It would seem that "perfect sound forever" hasn't especially panned out. Could this be one possible impetus for CD wall art? There is, to be perfectly honest, another spin in all of this. For my own purposes, I basically only play a physical CD once - that being when I copy it to a music server. Once done, I store them in plastic containers and eventually haul them to a storage facility about ten minutes from home. At that point, I could legitimately use them for cheesy wall art, or as mini Frisbees, or pretty much anything my imagination could create. I would, of course, never do that because who knows, one day I might actually need them for something important - like a music source. It seems perfectly logical that as time and technology progress some things, while once popular, become displaced. When looking at means of travel, for instance, we went from horse and buggy, to the Model T, to the station wagon, to the modern incarnation of the automobile. In modern times, horse and buggies are almost the exclusive province of sightseeing in downtown sections of the city and cars of yesterday wind up in either junk yards, or as restored masterpieces - and most of those are in museums or private collections and not used as a daily driver. It is a logical byproduct of technological advancements that as the years pass, one technology eventually supplants another, and what was once popular becomes largely forgotten - or made into cheesy wall art, whichever is more likely. 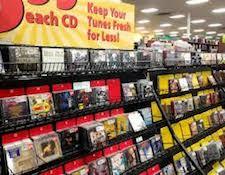 Oddly enough, I really have no problem at all finding and buying CD's. If a desired work by an artist is not readily available at my local music store, I have yet to find very many instances where that selection is not available online. Amazon, for instance, has what appears to be an endless array of CD's that might be ordered and shipped in a few days to your home. They also have, on a growing number of occasions, LP's and even on mostly rare instances, cassettes for sale - and that is another kettle of fish entirely. Of course, Amazon also has, not surprisingly, their own streaming service. It is also deceptively simple, and with little more effort than an Internet search, to find multiple outlets online that might be used to purchase music in any format. I once bought an LP from The Netherlands - all from the comfort of my listening chair. In any event, for those inclined to create cheesy wall art with their dusty collection of CD's I wish you happy painting. As for me and my purposes, I will hang on to yesterdays' technology for a while longer. Despite not living up to its original mantra of "perfect sound forever," I see the CD as pretty amazing sound for me, right now, today. Forever? Ah, maybe not, forever is a pretty long time. And while my crystal ball cannot tell me about the future of CD's, one thing of which I can be absolutely sure, I won't be reaching for a jewel case and a paint brush anytime soon.